This calculator solves the Friis transmission equation for any of its variables. 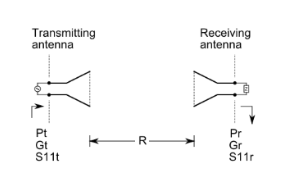 The Friis transmission equation relates the power received by an antenna to the power radiated by another antenna, a specified distance away (in free space). Modified forms of the basic Friis equation allow for inclusion of many system factors, including antenna mismatch, absorption in the propagation medium, cable loses, etc. The Antenna Magus calculator includes antenna mismatch effects, as shown below. Polarisation and physical misalignment are not compensated for, but may be considered by adjusting the figures used for the gain of the respective antennas. .